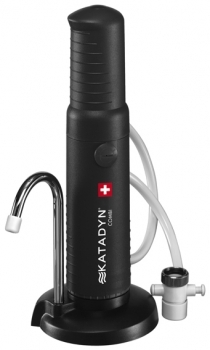 The Katadyn Combi plus Water Filter combines a silver impregnated ceramic element and a refillable, activated carbon cartridge. It is effective against bacteria and protozoa and also reduces chemicals and bad taste. 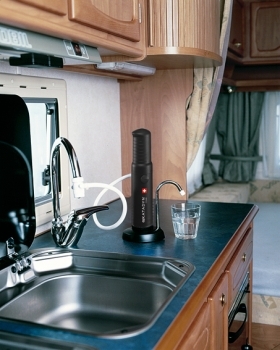 With the “PLUS” the Combi Water Filter can be connected to a water faucet for multifunctional use in campers, cottages or boats. Katadyn Article number: 2041000. - This activated carbon filter can be inserted into the hose without any great effort and filters the water before it is let into the tank. The filter filters suspended materials up to 5 microns and chemical impurities, such as chlorine and pesticides out of the water. When not in use the filter should be stored in a dry place and be replaced after 2 years.